Alvin is a deep diving research vessel designed specifically for oceanographic research. It is owned by the US Navy and operated by WHOI. Capable of diving 14,764 feet deep, Alvin makes as many as 200 dives a year. The original Alvin was designed and built by the Applied Sciences Division of Litton Industries (formerly Electronics Division of General Mills Inc.
Alvin’'s numerous unique dives have made it famous. In 1966 Alvin was pressed into service by the US Navy to perform a unique salvage operation. A hydrogen bomb had accidentally been dropped off the coast of Spain in the Mediterranean Sea. After two attempts Alvin successfully located the bomb. 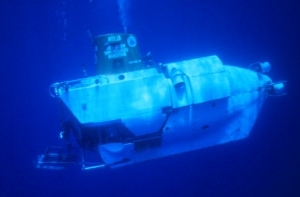 In 1974 Alvin was used for Project Famous (French -American Mid-Ocean Underwater Studies), and made 17 dives along the rift valley of the Mid-Atlantic Ridge. Alvin is also well known for its use in the discovery and observation of the ocean liner Titanic. The sub has completed more than 3,300 dives. Note: for further information on Alvin'’s first 25 years see, Water Baby, the Story of Alvin by Victoria A Kaharl, Oxford University Press, 1990.